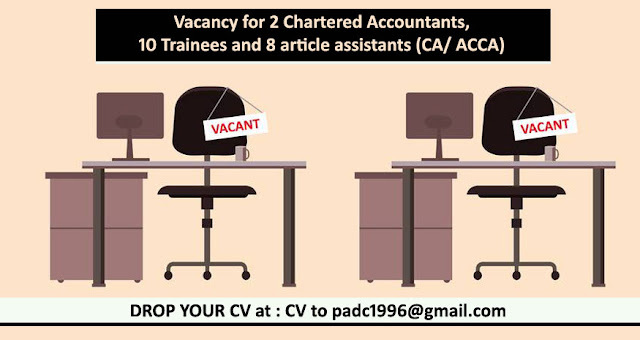 A renekwoned Chartered Accountancy firm based in Kathmandu have vacancies for 2 Chartered Accountants, 10 Trainees and 8 article assistants and applications are welcome from ICAN, ACCA, ICAI and University students. Our remuneration packages are designed to attract and retain the best people. We are offering a very competitive salary as well as study leave in excess of ICAN recommended periods. Preferably persons having experience in chartered accountancy firm and having good knowledge in MS-Office and ERP systems are appreciated. The recruitment process involves both an interview and written test. Interested and qualified candidates to send their application accompanied by an up to date CV to padc1996@gmail.com . Please mention the position you are applying for as the subject. Only Short-listed candidates will be called for an interview.